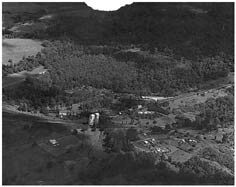 Looking west towards the Illawarra escarpment with the Eleoura Colliery in the middle and the Hall at the bottom right hand side. Photograph from the Illawarra Coal website. Wollongong and 2 km west of Dapto and Kembla Grange. Wollongong is situated approx. 90km from the centre of Sydney. The village has only one street, West Dapto Road and has an access to the Eleoura BHP Coal Mine, formerly the Wongawilli Colliery established in 1915. There is a private BHP rail line to the mine and early in the century had a Coke Ovens battery. The surrounding district is prime dairy cattle and farming country. 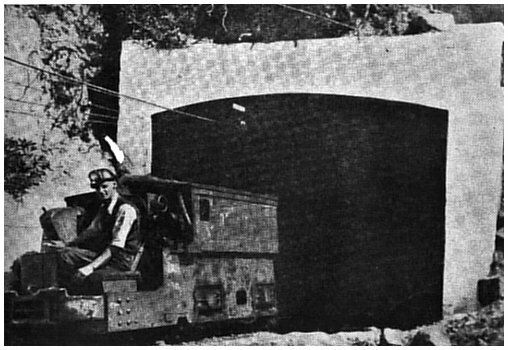 Picture right: A worker on a Electric Wire Trolley Loco at the entry to the Wongawilli mine, from Illawarra Coal website. The Community Hall was built in the 1950s on BHP Land and since 1990 has been the home base of Wongawilli Colonial Dance Club Inc, which holds weekly bushdances on Wednesdays from 8pm. There is a local beleif that the name Wongawilli is Aboriginal and means 'windy gully'. 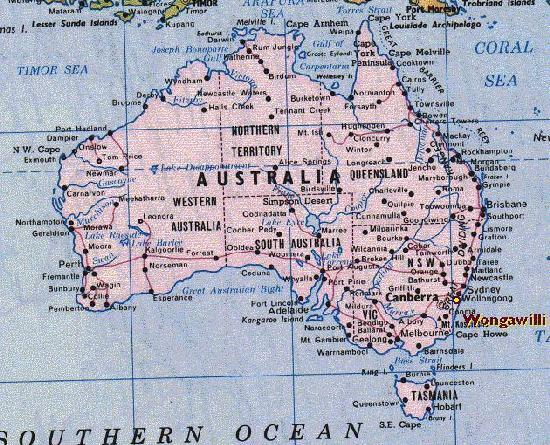 The term Wonga is used as a description for a large Australian pidgeon and 'willi willi' is a small cyclone or wind gust, so there is some connection to the local meaning. From Sydney - travel past Wollongong on the Southern Freeway (F6) and turn off after passing the Nan Tien Buddhist Temple at Berkeley onto Northcliffe Drive. Turn right towards escarpment and travel to Princes Highway. Turn left ontop Princes Highway and turn right onto West Dapto Road about 500m down the road. Entry to Kembla Grange Racecourse is on left. Travel to end of road (heading for Colliery on the escarpment). From the South - travel along Princes Highway passing Albion Park Airport. Turn off to Dapto after Yallah. Travel into Dapto, passing Showground and turn left onto Bong Bong Rd (Dapto Pub on corner). Travel along Bong Bong Rd to Shone Ave and turn right. Travel to West Dapto Rd and turn left into Wongawilli. Travel to end of road (heading for Colliery on the escarpment). The Primary School, now a residence, operated between June 1927 to December 1976 (1). The first coal washery was established at Wongawilli in 1920 by BHP. (2).